In the last seven months, we’ve covered a significant number of topics related to deportation defense precisely because so many people are being arrested—not due to police having reasonable suspicion or probable cause—but simply because they were suspected as being immigrants. While some New York legislators have worked to make progress in protecting these individuals, New Jersey, unfortunately, has fallen behind. 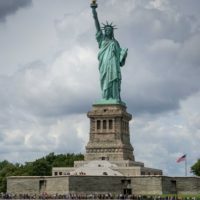 Unfortunately, immigrant arrests in New Jersey have largely included those without criminal records: Just between January and May, close to 3,000 immigrants were arrested in New Jersey and New York—a 38 percent increase compared to this same time last year—the difference being that 25 percent of them had no criminal convictions whatsoever this year. This inevitably begs the question: do some of these arrests carry civil rights— i.e. discrimination implications — if people are being arrested simply because of the way that they look and not due to what is typically required in order to be arrested for a crime (i.e. reasonable suspicion and/or probable cause)? Arguably, yes. In New Jersey alone, 44 percent of the close to 1,400 people arrested just within these four months had no criminal convictions. These statistics are beyond troubling. There is no question that the claim that “criminals are a priority” simply is not truthful. Many are being arrested under the claim that they are part of a gang even though they have no prior criminal records. There is no question that law enforcement is, on some occasions, merging the criminal justice system in with its deportation policies, and violating your rights in the process. If you are concerned that your rights have been violated during an arrest, speak with our experienced criminal defense attorney right away. Phillip J. Murphy has been defending victims accused of crimes throughout New Jersey and New York for more than 25 years. Contact us today for a free consultation and allow us to help.